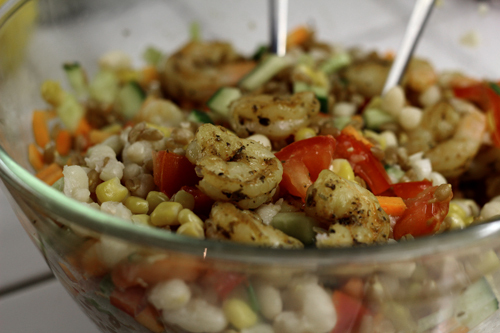 The good thing about asking what to have for dinner is that I got recipes I haven´t tried before, one of them being a very fresh salad with blackened prawns. The funny thing, I got it from a fellow blogger who had adapted it from another food blogger and now I´m adapting it… It´s like the whispering game…You say a word in someones ear and ten ears later it´s a totally different word. Yellow, red, green and shrimp. I haven´t bought prawns for a long time, I always buy the small lobster tail when I find it on a good price. 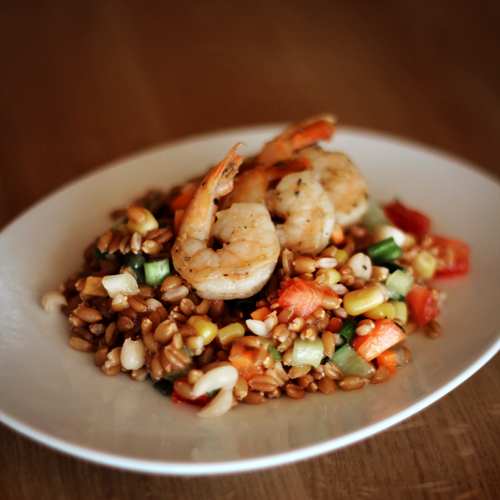 What I love about this salad is the combination of warm and cold ingredients, the warm farro, beans and prawns and then fresh raw veggies. It was a big hit at the dinner table tonight. Instead of Quinoa I used organic Farro. I didn´t have black beans so I used Cannellini beans. I didn´t have cilantro and I skipped cumin. Instead of Farro one could also use Barley. Blackening seasoning for the prawns, I used paprika, oregano, hot pizza spice mix, salt and pepper. Boil beans, boil Farro. Dice the veggies rather small. Blackened the prawns. 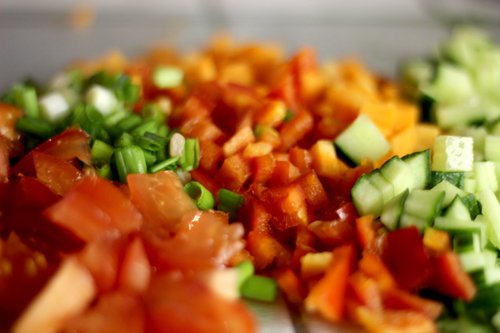 Mix everything together in a big bowl and serve. More about authentic blackening seasoning and how to do the blackening here. 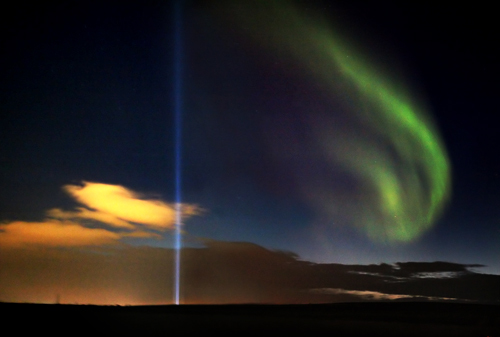 Every year Yoko Ono comes to Iceland to light up the Imagine Peace Tower. It is a beautiful light beam and even more impressive when the Northern Lights are around. o my and the cannellini in the chili I made from your recipe last night…it was AWESOME.